At Otis Spunkmeyer, we spend our days baking, experimenting, testing and talking about delicious baked goods. (Tough job, we know...) It's what we've been doing for over 35 years, and our goal is to keep improving. So we are making better treats (you've got to try one of our new cookies, cakes and muffins), out of fewer ingredients (we're using simpler recipes, no artificial flavors, colors or high fructose corn syrup). Enjoy. I will never forget my first Otis Spunkmeyer cookie! It was at church during a little get together and oh my word, it was delicious. The chocolate was evenly dispersed. I'm not ever sure how that was possible but each bite was amazing! 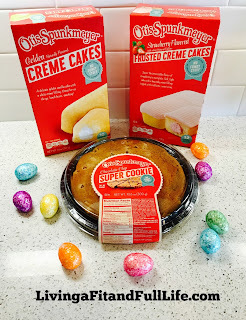 This Easter add a little Otis Spunkmeyer to Easter baskets for some yummy delicious treats. Otis Spunkmeyer's Crème Cakes are like little bites of heaven. The creme is oh so good! Otis Spunkmeyer's Frosted Crème Cakes are a bit sweeter due to the frosting but I absolutely love the strawberry flavored ones! Otis Spunkmeyer's Super Cookies are the perfect size. Otis Spunkmeyer's Super Cookie tasted just like their smaller cookies that I had years ago but this super cookie is enough to share, or to at least last you awhile. Another thing I love about Otis Spunkmeyer's treats is that they contain no funky stuff so I can feel good about sharing them with the kiddos! Otis Spunkmeyer treats would make terrific Easter basket additions and I highly recommend them! Otis Spunkmeyer is available at grocery stores nationwide including Walmart, and also sold online via Amazon Fresh. Click HERE to learn more about Otis Spunkmeyer! Follow Otis Spunkmeyer on social media!